The Hutchinson Elementary PTO is a Parent-Teacher partnership that supports the school community through fundraising and volunteerism! We are a 501(c)(3) organization. Join us on the lawn behind Hutch for an outdoor movie. Come early and mingle – movie will start around 8:15PM. Sign Up for Watch D.O.G.S. 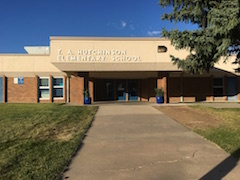 Hutchinson Elementary was built in 1973 and was named for Theodore (Ted) Arthur Hutchinson, a developer and builder in the Denver area. It serves students in grades K-5.